A new sensor-fitted T-shirt that analyses movement, breathing and heart activity, can measure stress levels throughout the day and also monitor sleep. 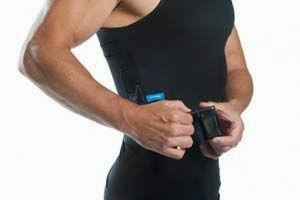 The Hexoskin T-shirt and companion device, currently being developed in Canada, sends the data to an online account via a smartphone. The T-shirt component is machine-washable and water-resistant, and can be worn under any type of sportswear to measure athletic performance in real time. Hexoskin features a precise breathing volume measurement. Breathing volume is also a key marker for sleep monitoring. To monitor the quality of sleep, "the combination of movement, breathing, and heart sensors gives a lot of information about your sleep states (wake versus sleep, movements and sleep positions, light versus deep sleep)," Fournier added. The device picks up activity and stress levels throughout the day. "We use activity patterns, breathing patterns, heart rate variability and other factors to measure stress during the day," Hexoskin CEO Pierre-Alexandre Fournier told 'Gizmag'. The device is also designed to make life easier for sports professionals who need to manage teams. For sports coaches, the company has developed the Hexoskin Team app to allow professionals to programme, time and annotate the training routines of athletes.